The real St. Valentine remains shrouded in mystery. 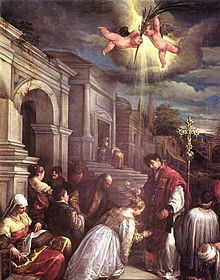 The guy that is venerated by the Roman Catholic Church is a guy named Valentinus who died on February 14th sometime in the fourth century. The most popular martyrology associated with Saint Valentine was that he was imprisoned for performing weddings for soldiers who were forbidden to marry and for ministering to Christians, who were persecuted under the Roman Empire; during his imprisonment, he is said to have healed the daughter of his jailer Asterius. Legend states that before his execution he wrote “from your Valentine” as a farewell to her. The guy is associated with love because of his willingness to defy the law in marrying soldiers. The truth is that the Valentines Day we now celebrate didn’t really start until the 15th century when lovers began to use the day to exchange hand written notes and cards to express their love for each other. Now, there are whole industries devoted to this holiday tradition. Now I know what me and my wife can do this year: get matching skull and roses tattoos. What do you think of this design? The North Side Irish Gang lost seven members that day to Al Capone’s South Side Italians. Not pretty. Me and her getting matching tattoos would probably generate the same reaction. The country however has moved on and St. Valentine’s Day is once again on a romance footing. Advice is plentiful in how to make this a great holiday. I offer only this, that men and women expect different things on this day. Women expect romance: cards, flowers, candy but also some genuine expression of feelings of love more than all that. In a way this holiday is made more for women than men. I mean try to think of anything macho about Valentine’s Day and all you get is the St. Valentine’s Day Massacre and skull and roses tattoos. This holiday is about romance which is the lifeblood of love for women and to be blunt some men are good at it and others fail. I do apologize to the ladies, but it is not something we naturally do, we have a hard time thinking and expressing our feelings at the same time. Usually we have to think and plan first and then feel as we follow through with the plan. If we don’t plan well at least give us credit for the attempt, most of us mean well anyway.